One of our most unique and popular products is our ArmPro Compression Sleeves Collection. Our collection of unique compression sleeves is sized to fit both Men and Women – Unisex-Adult. So, don’t be disturbed when the model is a beefy guy who lifts weights all day. 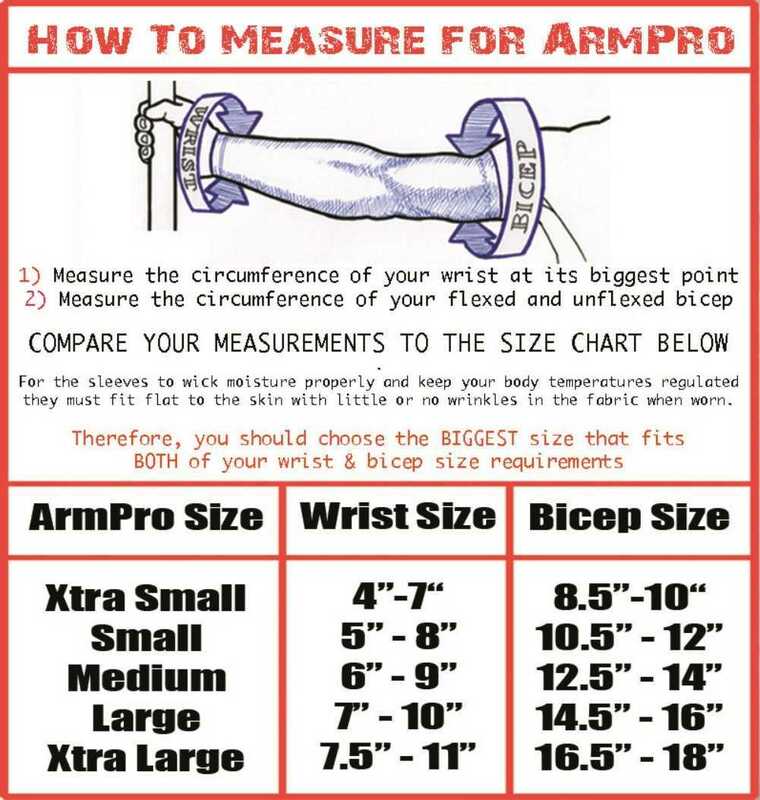 Use the sizing chart provided for a perfect fit - find it below and on each page. These sleeves are designed to protect you from sunburn caused by harmful Ultra Violet (UV) rays. Having earned an SPF 50 UV rating, they actually do triple duty: (1) They keep you cooler on hot days (evaporative cooling), and warmer on cool days; (2) They protect your delicate skin from sunburn by blocking UV rays; and (3), they provide about 12-pounds of muscle compression in order to fight muscle fatigue on longer rides. ArmPro Sleeves are made from a hi-tech moisture wicking fabric that absorbs moisture from your skin and traps it in the layers of the fabric. When riding your bike, the relative wind makes contact with the moisture in the fabric just before it reaches your skin. The moisture evaporates, cooling the skin. It's called evaporative cooling. ArmPro Compression Sleeves are available in over 30 stunning colorful tattoo designs and solid colors. Once you try them, you will love them. Styles include solids and artistically designed tattoo prints. If you have real ink, these unique sleeves will also help prevent tattoo fading by minimizing sun exposure. If you don’t have ink, now you can look like you do – or, you can go with a solid color. “Support our Military” styles include the well-known POW/MIA theme, as well as Thank-A-Vet, and Iraqi Freedom styles. Your AmPro home is right here with Wisconsin Harley-Davidson®. *For a more complete understanding of the therapeutic value of compression sleeves, please read the following. To really understand how compression socks and sleeves work, it’s important to have a basic understanding of how blood flows through the body. The heart pumps oxygen containing blood to our extremities and working muscles though arteries. Once the cells use the oxygen and other nutrients from the blood, the then deoxygenated blood, along with lactic acid and other waste products enter the veins to get taken back to the heart. Once the blood gets back to the heart, it’s oxygenated from the lungs and the process is repeated. Keeping oxygenated blood flowing to muscles is important for performance. The more oxygen the cells have, the better they will function. During exercise, the body produces lactic acid as a waste product. If this lactic acid is not removed from the muscles, it can contribute to soreness and decreased ability to perform. Another factor in decreased performance is muscle fatigue. Muscular vibration during physical activity contributes to fatigue. Think about how much shock and vibration is going through your leg muscles as you pound pavement with 3-5 times your body weight while running. Over time, those little vibrations of the muscles add up and they become fatigued.” -Fleet Feet Sports, Hartford, CT.